A celebrated artist in his day, Boucher was favored by Madame de Pompadour and was named First Painter to King Louis XV. He gained further renown as a superb, versatile draftsman, and his drawings in many different media were highly regarded by collectors during his lifetime. In both painting and drawing Boucher treated a great diversity of subjects, including mythology, nudes, landscapes, genre scenes, and portraits. To his contemporaries Boucher's theatrical realm of sensuous make-believe seemed appropriate for such worldly themes yet less suitable for religious topics. Within the scope of sacred subjects, his drawings- made chiefly for himself- far outnumbered his paintings. 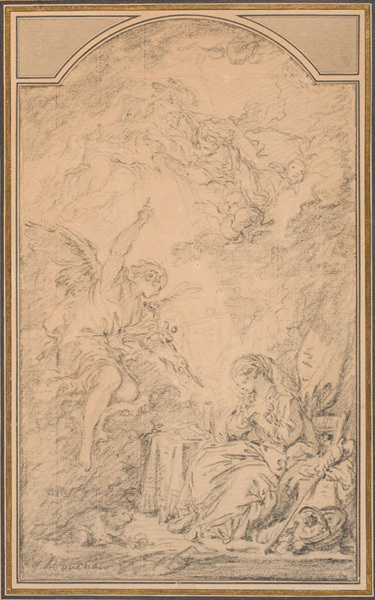 Worcester's drawing shows the angel Gabriel hovering near Mary, to announce to her that she will bear the Son of God. Above, reclining on a cloud like a pagan divinity, God the Father releases the Dove of the Holy Spirit. The rounded top of the drawing suggests that it may have been a design for an altarpiece, perhaps a preliminary sketch, as indicated by the loose handling of the black chalk.